Mrs. Brawdy is using her new raise to retire her 17-year-old GMC Yukon. 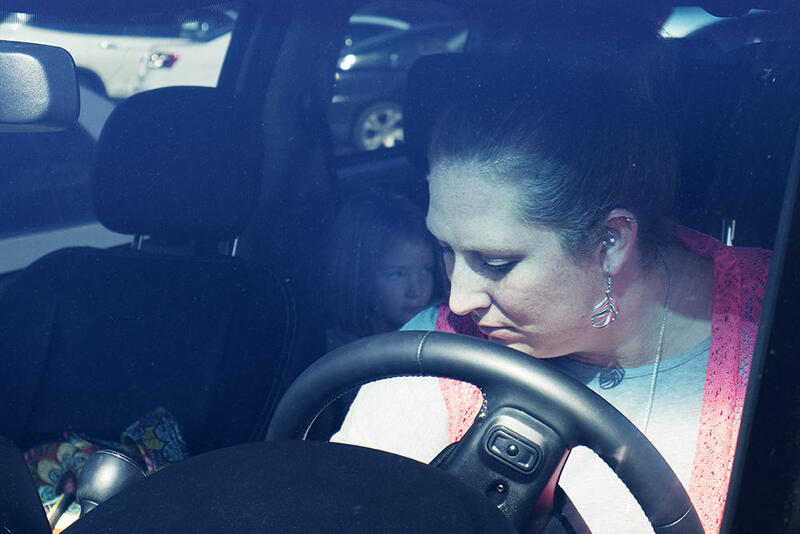 Mrs. Brawdy and her daughter prepare to leave school on Tuesday in her new Dodge Grand Caravan, which she was able to purchase due to the recent teacher raises. That transportation is crucial as she spends her nights continuing her own education, pursuing a Master’s in Special Education, Mild-Moderate Disabilities at the University of Central Oklahoma. It has taken her five years to pursue her degree. She graduates in December. Though that hasn’t stopped her from being politically and civically involved. “We still are fighting that fight behind the scenes with the elections coming up,” she said. One example: the teachers work together to cover each others’ classrooms during elections. Not only is she concerned about education as a whole, but she’s also particularly passionate about the future of special education in the state. Mrs. Brawdy said that she thinks special education teachers are “like unicorns, [...] they are a rare breed,” especially in Oklahoma. The average salary for an elementary school special education teacher in Oklahoma, like Mrs. Brawdy, is $41,820, according to the Bureau of Labor Statistics. That is nearly $20,000 less than the national average, as reported by BLS. Mrs. Brawdy said the low pay gives no drive for educators to decide to stay in the state or move here, when, on average, teachers in other states earn more. This can be difficult for special needs students in particular because those students require specialized instruction and do better with a consistent routine. Mrs. Brawdy warns of these routines being destroyed altogether due to the lack of special education teachers available to students. 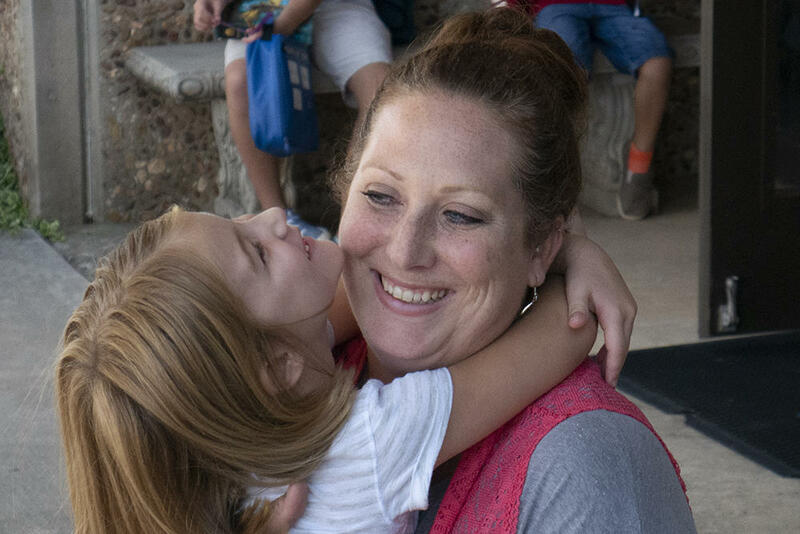 Mrs. Brawdy hugs her six-year-old daughter outside of the James Griffith Intermediate in Choctaw, Oklahoma at the end of the day. While the raises have provided hope within the state and for Mrs. Brawdy, she said she still thinks there’s work to be done. With the current governor’s term coming to a close, teachers like Mrs. Brawdy are hoping to find a new candidate that is outspoken about improving the education system. Mrs. Brawdy, who said she has voted in past elections, feels that taking part in the walkouts have awakened something more in her, particularly when female lawyers joined the teachers at the walkouts. 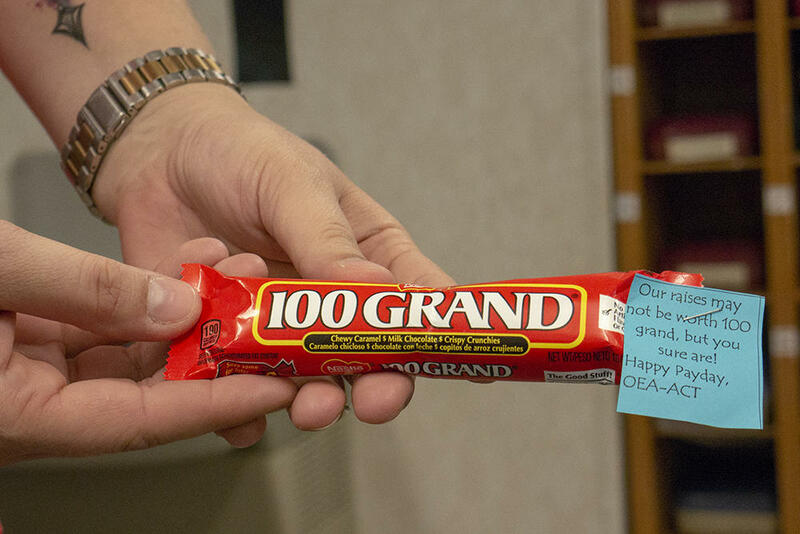 Mrs. Brawdy holds 100 Grand candy bar. She gave these out to her colleagues on the day of their first pay raise. This story was produced by Oklahoma State University student Zach Goshorn as part of NPR's Next Generation Radio project. KOSU hosted the project this fall, which aims to train the next generation of public radio journalists. Read more about Zach's experience during the project here.